This cluster is nearly as large as the full moon, and contains 30 stars which make it shine at a total magnitude of 4.6; the brightest star is of mag 7.6. Its age was estimated at 660 million years. 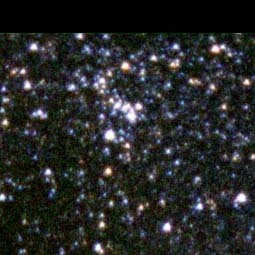 NGC 6633 has been discovered by the Swiss astronomer Philippe Loys de Chéseaux during the years of 1745-46, it is his No. 3. It was independently rediscovered by Caroline Herschel on July 31, 1783, who added it to her list as No. 8. Her brother William included it in his catalog as H VIII.72. The image from our page was obtained by Till Credner and Sven Kohle of the University of Bonn, Germany when evaluating their Constellations Scutum and Serpens [Cauda] photography. The Scotchchrome 400 color film image was obtained on June 10, 1994, 23:57 local time on Cerro Tololo by Sven Kohle with a 50 mm f/4.0 photo lens, exposed 60 min. The original image has a 27x39 deg field of view; our image is a magnification. This magnificient object is contained in a large number of observing list, e.g. as No. "S11" in Paul Ahnert's Easy Object List, in the SAC 110 Best NGC List, in John Caldwell's List, in the RASC's Finest N.G.C. Objects Objects list, and in the Astronomical League's Deep Sky Binocular Club List.